Over 25 years experience in landscaping gives us the skills and knowledge to provide any garden improvement jobs you have. We are available for all landscaping jobs including decking and turf replacement. We offer our customers an unrivalled landscaping services throughout Glasgow and the surrounding areas. All work carried out to a guaranteed high level. We offer many garden improvement services. For a full list of our skills on offer see below. 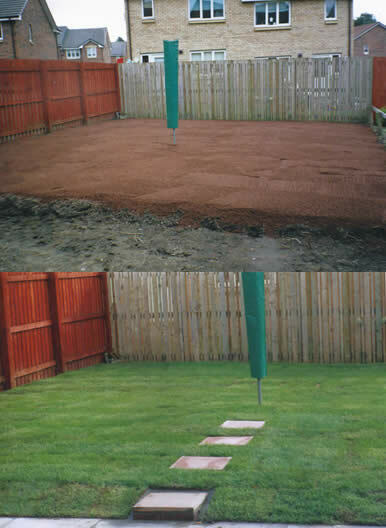 Click here to view a slideshow of garden improvement work we have previously done, services and solutions offered. Full design service is available to transform your garden into the dream area you always wanted. We will supply all materials required for the work. Decking is becoming more and more popular with our clients. It is the ideal way to create an area of your garden for relaxing and socialising in. We will design, supply and fit decking areas tailored to your needs. All outhouses, garages, sheds and greenhouses removed.